How to set up reverse tethering over USB? I don't have a data plan. Sometimes I want to connect the phone to the Internet when there isn't Wi-Fi, to update Market apps, backup SMS messages to Gmail, sync new contacts from Gmail, etc. Things I can't do with USB mass storage mode. Is there a way for the phone to access the Internet through the USB connection to the computer? If so, how do I set it up? I recently discovered SimpleRT which works very well with Linux (and apparently OSX as well). Simply enable USB Debugging on your device (no root required), install the APK linked from that page on your device and connect it to your PC via USB, and then run the binary on your PC. It will set up the connection as a VPN tunnel (tun0 by default) and your device should prompt you to (a) allow SimpleRT to create/oversee the VPN connection as well as (b) whether to run it when the device is configured as a particular USB accessory (which is what the binary does). The project does not include a pre-built binary, so I've uploaded one I built for Ubuntu. On Nexus One: Connect USB cable and activate USB Tethering. You should see on linux or windows a new network interface. You should now be able to connect to Internet on your phone using your computer’s Internet connection. Try to do a ping www.google.com to be sure ! Then on your phone, uncheck the USB Tethering option ! There are some more possibilities -- but all of them I know of require a rooted device. First, there's an App named Reverse Tether available for free on the Play Store (it's a limited trial, which restricts the time you can be connected -- but at least you can test this way whether your device is fully supported; the full version is about USD 5). 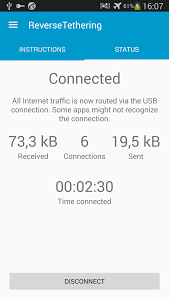 According to an article at AndroidAuthority, setup should be as easy as 1-2-3: Plug in the USB cable, start the app, let it auto-configure (manual configuration is available as well) -- and there you go. You can also let it ask you to connect when it finds an USB-connection. Several manual methods are available as well (and described e.g. at XDA) -- but they are mostly technically complex, and expecting you to patch system files; not for the every-day-user, but rather for the tech-freak. Another quite easy method is also described here, and involves editing the wpa_supplicant.conf file once (manually adding your ad-hoc Wifi network). I am a bit confused how to use it, please inform if you get it working perfectly. I've found a good tool for reverse tethering on xda-developers forum. It's called Android Reverse Tethering. It works with Windows and requires a rooted phone. It works fine on my HTC Desire HD running MIUI v4. Note: Works only in a rooted Android phone. Connect Android device via USB. Enable USB tethering. To do so, go to Settings → More... → Tethering & mobile hotspot → Usb tethering. At host machine, the usb tethering connection may be detected by the network manager. Its name will be something like "Wired connection 2" (or 3). You must edit it's "IPV4/Method" to "Shared to other computers". Now, as explained here at the end of Step1 you have to modify iptables with sudo iptables -t nat -A POSTROUTING -j MASQUERADE. But... prefer allow network manager to do it if possible. $ adb shell su -c "netcfg rndis0 dhcp"
$ adb shell su -c "ifconfig rndis0 10.42.0.2 netmask 255.255.255.0"
$ adb shell su -c "route add default gw 10.42.0.1 dev rndis0"
Now internet would be working in the Android phone. To check, at adb shell or android terminal, try the command ping www.google.com. I was looking for a reverse tethering solution that would work on my unrooted devices and with a MacBook, but I just could not find anything. Eventually, I started to develop my own solution. The result is an app that works on devices running Android 4.0 or higher on client side, and all major desktop OSs on the host side. I know this is an even later answer, but it is worth mentioning it. No app installation needed! * Which is not even possible if you do not have some other internet connection. There is a project called gnirehtet. That's it! For more information, read the readme file of gnirehtet on their website. *=Behind the scenes it will install an apk file on to your device via the USB connection. Not the answer you're looking for? Browse other questions tagged usb networking tethering reverse-tether usb-tethering or ask your own question. Use USB as network access for an Android device (reverse tethering)? How to access internet on my HTC Desire from my pc with USB? Internet access from my Samsung G II through my office PC network via USB? How can I get wired tethering on the Galaxy Rush to a WinXP? How to use phone as an USB Wi-Fi adapter? What's the reason Android Reverse Tethering require root? How to setup a reverse USB tethering connection (multiplatform)?